A first-of-its-kind survey on attitudes towards trade and investment in Iran conducted by public opinion firm IranPoll in partnership with Bourse & Bazaar, a business media company, points to strong public support in Iran for greater trade with other countries and related economic reforms. A resounding 85% of respondents feel that “growing trade and business ties between Iran and other countries” was leading to good or very good outcomes for the country. The results of the landmark survey will be presented by IranPoll CEO Dr. Amir Farmanesh to an audience of over 400 European and Iranian business leaders and policymakers at the 4th Europe-Iran Forum, which takes place on October 3-4 in Zurich, Switzerland. The survey, which was conducted in August 2017 among a representative urban sample of 700 Iranians has been published at a crucial time when debate over the Joint Comprehensive Plan of Action (JCPOA), also known as the Iran Deal, reaches a fever-pitch. While President Trump has expressed his disapproval with the deal, it remains popular among a majority of Iranians, with 62% of respondents approving. But doubts and frustrations have emerged since the agreement was concluded in 2015. Acutely aware of President Trump’s rhetoric, 77% of Iranians have little or no confidence that the United States “will live up to its obligations under the agreement.” By contrast, public confidence in the European commitment to the JCPOA remains strong, with 57% of respondents believing the Europeans will stick with the agreement. Against the backdrop of political uncertainty, economic dividends of the agreement remain unclear. While 43% of Iranians report that the “availability of goods made by multinational companies” has increased in Iran since the nuclear deal, majorities say foreign investment and job creation by multinational companies have not increased since the signing of the JCPOA. . However, Iranians do see improvements in the way businesses are operating, with both Iranian and multinational firms making greater efforts towards supporting employee training and technological innovation in Iran when compared to five years ago. While public sentiment towards globalization has soured in many countries around the world, Iranians believe that Iran should increase its role in the globalized economy. A majority of Iranians (62%) believe that globalization is having a positive effect worldwide, with just a third (33%)believing the effect is “negative.” Specifically in the case of Iran, a dominant 85% of respondents felt that “growing trade and business ties between Iran and other countries” is leading to good or very good outcomes for the country. Iranians also see positive effects on job creation and wages with 51% of respondents believing that “trade with other countries” creates jobs, and 40% of respondents believing there is an attendant increase in wages (36% see no impact). As the country reaches out to foreign partners, members of the Iranian public have a strong opinions as to which countries have the most to offer. European countries and Japan are the most desired trading partners among Iranians. The greatest confidence was expressed for German and Japanese investments, with 66% and 67% respondents stating that there is “a lot” of benefit for Iran when these countries invest. 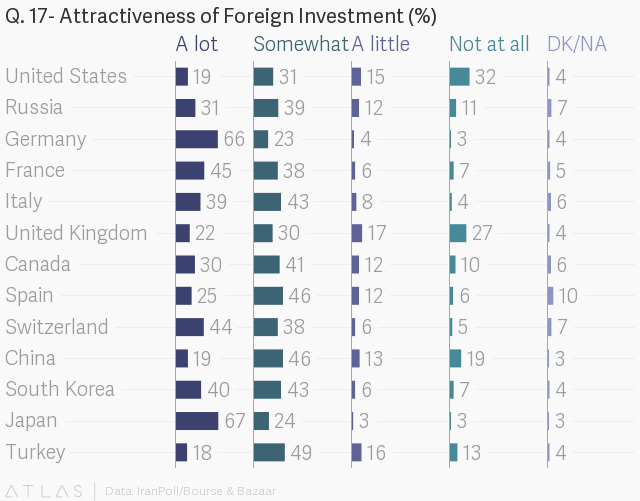 French, Swiss, and Italian investments were also seen as highly beneficial. Importantly, European firms have made significant inroads in the Iranian market in the last few months, with notably deals signed by European multinationals such as Total, Renault, Alstom, and Siemens. "Now I will read you the names of some countries. As I read the name of each, please tell me the degree to which you think it would be in Iran’s interest for more companies from that country to invest and trade with Iran:"
During the period of economic sanctions, China became Iran’s largest trading partner, surpassing the European Union. However, while 65% of Iranians believe that Chinese investment in Iran is in Iran’s interest, only 19% strongly believe that to be the case. That Iranians exhibit significantly less confidence in the benefits of Chinese investment may help explain why the Europeans have been able to conclude the lion’s share of new commercial agreements following the lifting of international sanctions. Despite the negative view of Iran in the United States, half of Iranians believe that American investment would benefit Iran (19% strongly). As Iran begins to modify its laws and policies to help facilitate foreign investment, the domestic debate on economic policy in Iran has become more important. While 56% of respondents believe that Iran should keep tariffs on imports in place, there is clear public support for economic reforms that will help spur foreign investment by major multinationals. An overwhelming majority (86%) of respondents would approve of policies that make it easier for multinational banks to operate in Iran and 87% support policies that encourage foreign investment. The same proportion of respondents would approve of policies to make it easier for “heads of multinational companies” to travel to Iran. Beyond the clear public support for the macroeconomic benefits of globalization, Iranians also have strong opinions about the role of the business community in the process of economic development. At a time when the Trump administration is threatening to de-certify Iran’s compliance with the JCPOA and re-impose broad sanctions on the country, the pace of multinational investment in Iran has frustrated Iranians, with 70% of those surveyed suggesting that multinational companies are “moving slower than they could” to invest in Iran. When asked what is causing multinational companies to move slowly, 77% of respondents identified “fear of the United States” as the primary reason. "Are multinational companies moving as rapidly as they can to trade and invest with Iran now that some sanctions have been lifted, or are they moving slower than they could?" While it remains ambiguous whether jobs will be created in the near-term, Iranians do have a clear sense of who they consider to be the primary drivers of economic progress in Iran. Despite the historical dominance of Iran’s state-owned enterprises, when asked to evaluate whether state, private, or multinational companies will be the main contributors to economic improvement, just 31% chose state companies. Iran’s private sector companies enjoy the greatest degree of the public’s confidence, with 41% of respondents believe these firms “can best help to improve economic conditions” in Iran and 21% of respondents see multinational companies having the most positive effect. The confidence in private enterprise demonstrates further public support for Iran’s accelerating efforts of privatization in the post-sanctions period. That support for private firms and multinationals combined outweighs that for the economic leadership of state firms lends support to government efforts to support foreign investment and privatization in tandem. "Which one of the following kinds of companies do you think can best help to improve economic conditions in Iran?" Yet, Iranians still do not feel their economy is accountable to the public. A majority of those surveyed, 57%, believe that Iran’s economy is “run by a few big interests” while just 38% believe it is “run for all the people.” One measure of success in the coming years of economic reform will be whether this proportion shifts. Importantly, the vast majority of Iranians believe they have “freedom of choice and control” over their direction in life, with 93.4% agreeing with the notion that “people shape their own fate.” Tellingly, 49% agreed with this statement in the strongest terms. These findings suggest that Iranians have a strong individual impulse and a confidence that if afforded the right opportunities they will be motivated to pursue them. The question remains whether policymakers and business leaders both in Iran and abroad will take heed.